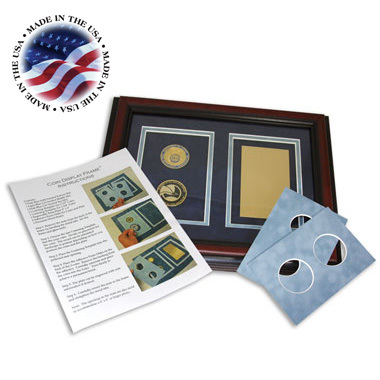 Create an instant award or gift with your favorite coins with this beautiful two tone cherry hardwood frame. It has suede mats and an engravable brass plate which is included. The recessed area to fit two 1.75" coins (sold separately). Outer frame dimensions 11½" x 14½". Individually boxed. $10 additional for engraving the plate. Made in USA.